Anna Naturals offers products made with all-natural and organic ingredients for everyday use, as well as pregnancy and breastfeeding. After quite some time, the owner of Anna Naturals struggled with breastfeeding her own daughter, Anna– at about 6 months in, her milk supply tanked, which was when she was introduced to fenugreek tea. The tea worked, but tasted awful. So she ended up spending forever cutting open the tea bags, mixing in her own ingredients and blending away until she hit on a blend that not only worked, but tasted great, too. A little while later, Anna Naturals was born! Anna Naturals applied their “just because it’s natural doesn’t mean it has to taste bad” philosophy to 7 other tea blends, and when they realized that their teas actually encouraged people to live more naturally, they decided to start developing skincare and essential oil items too. All of their products are completely free of artificial flavors, fragrances, preservatives and harsh chemicals BUT they smell great, feel great and even taste great! Anna Naturals’ believes that you shouldn’t have to give something up in order to get a product that is safe to put in, and on your body. In fact, they like to say “nature has never been this good”. Head on over to Anna Naturals’ website to check out all the great products they offer! 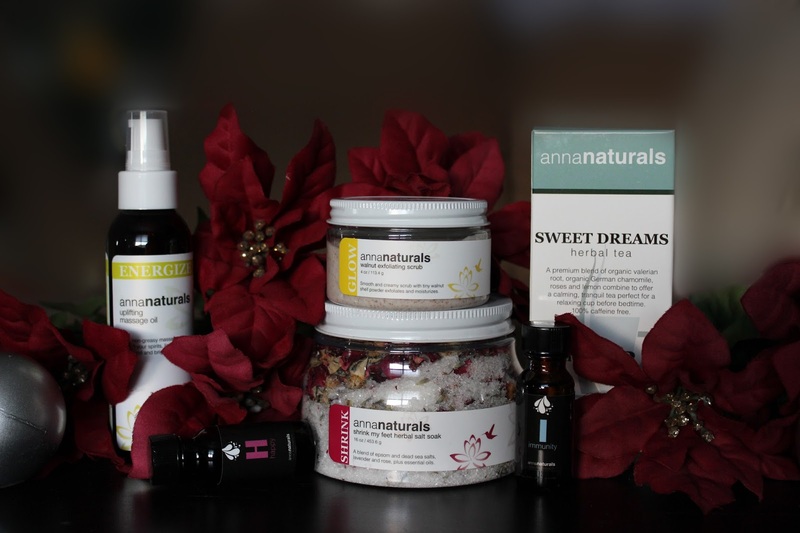 Stay connected with Anna Naturals on Facebook, Twitter, Pinterest & Instagram! 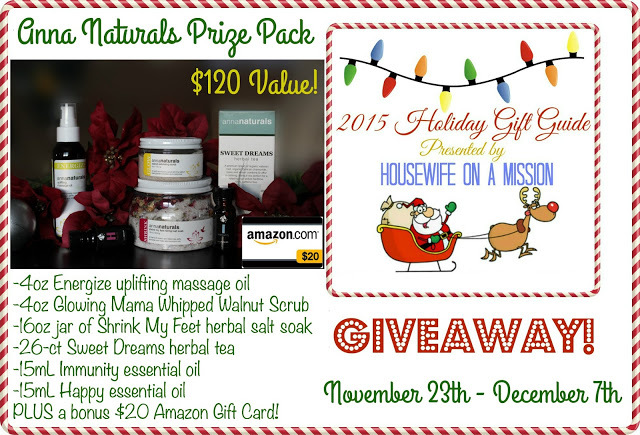 One of our fans are going to win an Anna Naturals’ Prize Pack with a $20 Amazon Gift Card, a $120 value! PLUS a bonus $20 Amazon Gift Card! Disclosure: Housewife on a Mission and the bloggers promoting are not responsible for prize fulfillment or shipment to giveaway winners. Winners will be drawn at random then emailed and will have 48 hours to respond to claim their prize. If no response is given, another winner will be chosen. Facebook, Twitter, Pinterest, and any other social media are not affiliated with this giveaway. I would like to give this to my friend. I am most excited to try the Energize: Uplifting Massage Oil! I would love the uplifting aromatherapy! I plan on keeping it for myself.. Don’t mean to be greedy, but I’m the most pregnant person I know right now.. I’d love to have a little extra pampering! I would keep this natural gift for myself. This is an awesome giveaway and would love it. I would be the most excited about the massage oil… It sounds so relaxing! I would love to win this as a gift for my cousin.